I graduated from the Government Medical College in Guwahati (Assam) in the summer of 2007 as an ophthalmologist. 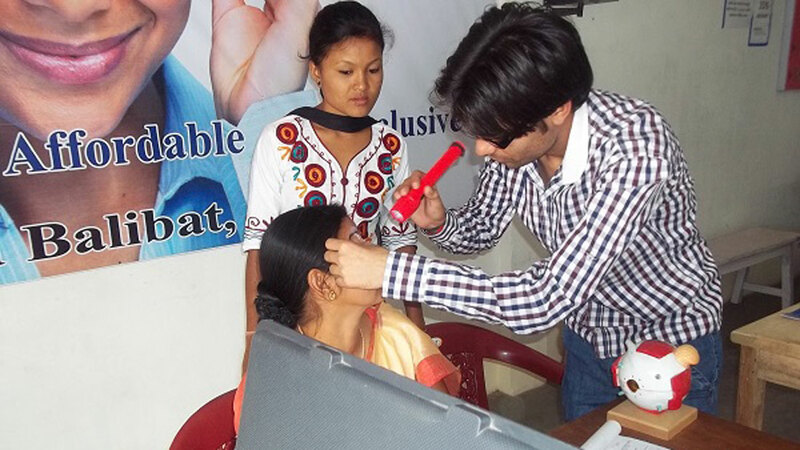 I was confident that I would start a successful eye care practice in Upper Assam, in my hometown Jorhat. But, starting an eye care practice requires considerable investment, so I opted to start in a corporate hospital at first. The patients were rich, could afford anything, and my paycheck was not something to complain about. It was not long, before I realized that treating high profile patients was not always a piece of cake. Many times, you not only treat the patient, but also their egos. It was during this realization that I began to hear stories of my fellow Assamese that were nothing like my wealthy patients. Stories like that of Bonti. Bonti Baruah, 45, is a weaver in a small, impoverished village in North East India. During the past two years, she began to find it difficult to weave as she could not see the fine threads. She knew she needed to get her eyes checked, but getting an eye check-up required her to have approximately US$ 30 in disposable cash. To Bonti, like many living under US$ 1.25 a day, this amount of disposable cash was out of the question. Because of this, getting her eyes checked took a back seat to all of the other more urgent conditions in her life. – Bonti would have to go into the city by paying US$ 2 in travelling expenses. – Like many women in India, she must ask a male relative to accompany her: adding an additional US$ 2 for his travel expenses. – Travelling to and from the city means a loss of US$ 6 in daily wages. – Once in the city, she has to pay a minimum US$ 4 consultation fee for the ophthalmologist. – Spending all day in the city means she will be hungry. She will have to shell out US$ 2 for a meal for two. At this point, Bonti has spent US$ 10 and lost US$ 6 in wages, and all she has is a prescription for her glasses. It is just a plain piece of paper – albeit with the power to change her life – but she has not yet regained her vision. – Now she must go to an optical shop and spend $10-20 for her glasses. – Once she gets them and other medication for US$ 4, she travels back to her village. Happy to finally see better. – In the case she has any problem with her glasses, she will have to return for an additional check-up, and spend another US$ 10. So, Bonti needs at least US$ 40 to get her glasses. With less than US$ 70-90 in monthly income, this is something she can only dream of. Bonti is part of the 85% of people in North East India who live in villages and are required to travel several kilometers to access eye care. What is more, she is part of the 80% of people in India who can get her vision back with corrective glasses or a simple cataract surgery. In this canvas, what was the small problem of Bonti’s eyes, has become indicative of the larger problem of finances and eye care for those living in in extreme poverty. – Patients equated free services with inferior quality. – There was a loss of self-respect and dignity in the patients because of the perceived inferior quality as they had no choice, but to get the free service. – Since services were free the hospital was only accountable to the stakeholders who funded the project, and not the patients they served. – The staff was not sensitized to customer care, as they saw themselves as already doing something good by providing free services. – And above all, in spite of the free doctor’s services, patients still had to lose a day’s work, shell out the travelling expenses, and pay for the glasses from their meager wages. In this position, it became clear to me: the need was acute, and large. Those living in poverty need accessible and affordable eye care that is “on demand.” This care must be transparent and accountable and ensures that the patient’s dignity remains intact. Eye care must be inclusive with no distinction made between rural and urban, or rich and poor. And finally, eye care must be quality assured. So there I was, looking at a large problem, with no clear solution. But I couldn’t quiet the part in my brain that kept repeating: Is this all I could do? Just observe? I knew I had to act. Dr. Parveez Ubed is the Founder and Managing Director of ERC Eye Care, a sustainable enterprise dedicated to providing quality, affordable and accessible eye care solutions for rural populations in North East India. An ophthalmologist by training, Dr. Ubed is driven by a passion to create a long-lasting solution to making eye care available to his fellow citizens in North East India and beyond. He blogs about the challenges, opportunities and passion of being a social entrepreneur and allowing North East India’s poor see clearly to a life without poverty. Did you know, Ennovent Impact Investment Holding and Ankur Capital along with Ennovent Circle members, Beyond Capital Fund and Sadeesh Raghavan had invested in ERC Eye Care Pvt. Ltd. Secure capital in early-stage enterprises with a diverse group of investors through the Ennovent Circle.